UPDATE – Since this newsletter was published, a number of Tzuba’s wines have become available in the US. As frequently mentioned in this newsletter, one of the most exciting parts of wine drinking is discovering new wineries or witnessing the continuing positive development of existing ones. This week I wanted to focus on a relatively new winery which encompasses both these desirable qualities – great wines and continuing improvement (the current, 2006/2007 vintages are superior to the initial 2005 offerings) – the Tzuba Winery. While these wines are currently only available in Israel, as you will see from some of my notes below, one can only hope that they will be imported to the US soon and, in the interim, its well worth the effort of bringing a few bottles back with you from Israel (or having a friend or local wine shop ship you a few bottles). Prior to launching its own label, grapes from this winery’s vineyards were being sold to and used in numerous high-end wines from other local wineries – always a good sign for an up and coming winery and a great way to foresee, to some extent, the potential such an endeavor might have. 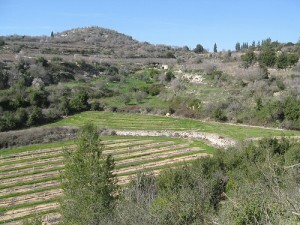 The winery is located on, and derives its name from, Kibbutz Tzuba. It’s first commercially produced vintage was in 2005, with approximately 30,000 bottles produced in that first year. Currently their wines are produced in three series: a top tier Hametzuda wine for which it currently intends to produce only in select years (but time will tell); Tel Tzuba series, which will include both varietal and blended wines, and should be viewed as the winery’s reserve level series; and their table wine series (which is quite good) labeled Hama’ayan. After hearing great things about the winery from numerous friends and receiving one bottle as a gift, I recently had the opportunity to taste a large selection of wines from this winery which left me hankering for more (thank you SD)! Take note, as I foresee great things for this little winery. As of now, the wines are very well priced but I foresee some price hikes in their near future. Tzuba, Hametzuda, 2006: Made mostly (75%) from Cabernet Sauvignon grapes with some Cabernet Franc (20%) and Malbec (5%) thrown in for good measure. Definitely one of their best wines and worthy of being the flagship wine of the winery. It will continue to cellar and improve over the next 4-5 years. An almost full-bodied wine whose abundant tannins are already well integrated with the plums, raspberries, black cherries and other forest fruit, the wine has generous hints of its Mediterranean heritage that are in full force through its long finish. An exciting wine. Tzuba, Tel Tzuba, Cabernet Sauvignon, 2006: While the oak is somewhat more forceful than I like to see in my Cabs, it is extremely well balanced by the fruit and tannins. A medium bodied wine with an evolving nose and palate of gooseberries, raspberries and black currants. Mid palate the fruit turns not-unpleasantly jammy which evolves and leads to a long finish of vanilla, cloves and oriental spices. While ready to drink now, the wine should cellar nicely for another year or so, but at approximately $17 (NIS 70), a very good buy. Tzuba, Tel Tzuba, Merlot, 2006: An intriguing wine and a delicious incarnation of the varietal, with ripe plums and juicy blackberries almost bursting out of the glass as the wine slowly opens. Loads of flavors on both the nose and palate including anise, hints of vanilla and freshly ground coffee beans. A medium, mouth-filling finish that gently lingers, rounds this one out. Tzuba, Tel Tzuba, Shiraz, 2006: I am always interested in the rationale winemakers (or their marketing department) utilize for labeling their wine “Shiraz” or “Syrah”. Some wineries (Dalton is a good example) have a philosophical reasoning behind the labeling and actually produce both “varietal” even though they are the same grape. I have inquired, but not yet received a response to the wineries view/take on this subject, and will update you when I do. A full bodied mysterious wine with tannins that are not yet fully integrated. Nice fruit, including blackberries, cherries and plums balanced with hints toasted oak and spices lead to a medium finish. Tzuba, Hama’ayan, Belmont White, 2007: A true “table wine” decently priced at about $12 (NIS 50). A delightfully crisp and refreshing, unoaked mix of Sauvignon Blanc and Semillon, with summer fruits dancing on your tongue balanced by enough acidity to keep the wine from falling flat on its face. Nothing fancy or sophisticated here, but a good, refreshing wine for quaffing.